Castle Pines North Pump Station – Martinez Associates, Inc.
Martinez Associates was retained by Brierley Associates through their contract with Black & Veatch to provide construction materials testing for the water tank, pump station and the pipeline for the Castle Pines North Metropolitan District in Douglas County. 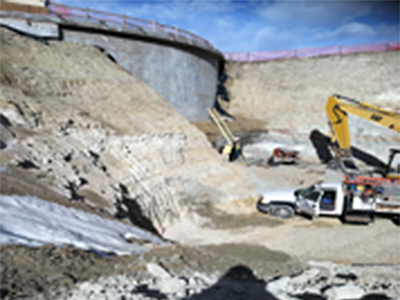 The project pumps water from the existing Centennial water tank to the towns of Castle Rock and Castle Pines North. 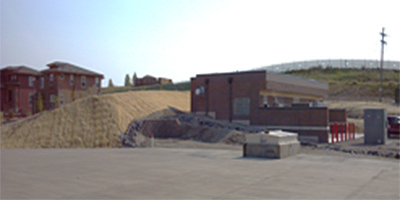 The pump station was located southwest of the intersection at McArthur Ranch Road and Monarch Boulevard in Highlands Ranch. The 10 million gallons per day pump station connects to an existing 4 million gallon tank through a 4.9-mile, 24-inch diameter metal pipeline that generally runs north-south through Douglas County. The project included construction of a 4 million gallon concrete water storage tank. The tank was 182 feet in diameter with 25-foot high walls, constructed with post-tensioned concrete and buried. Martinez provided preconstruction support by reviewing and consolidating the testing frequencies and requirements as set forth by the project plans and specifications and as required by the city of Castle Pines and Douglas County standards. Martinez also addressed questions raised during the preconstruction period and participated in the preconstruction meetings. Martinez materials testers and inspectors, provided the quality assurance support, reviewing of the contractor’s soils test results, observing the general construction for consistency with the geotechnical report, performing random field moisture-density checks of the pipeline and tank backfill and the fresh concrete and cured concrete cylinders for compressive strength. We also provided opinions regarding rock excavation, construction monitoring, and assisting with negotiations through the District.